Our Kasai Samurai Armor is one of the newest addition to our rapidly growing line of fine reproduction Japanese Samurai Armor. Completely crafted and hand made by the skilled armor craftsmen in the Fenglin armory; this is authentic Japanese samurai warrior armor suit is finished with iron rusting brown and black. Authentically detailed and completely reproduced after actual armor worn by the warriors of the Sengoku period, (1500's). This reproduction suite of armor is a great addition to any collection or a great start at a collection. This full sized reproduction of authentic Samurai Warrior armor comes with everything you see including the black lacquered display / storage box. This set is completely handmade of steel, silk, brass and other materials that have been used from the Sengoku era in Japan. 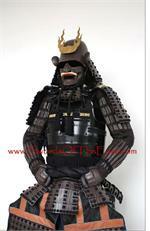 This is an incredible samurai armor set.